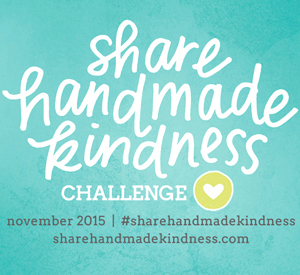 The Share Handmade Kindness challenge is an amazing initiative created by the lovely Jennifer Mcguire. It’s a challenge that has been set up for the month of November that does what it says on the tin – challenge you to share handmade things out of kindness. This could be anything from writing letters to baking cakes and as long as it’s handmade, it’s allowed. The month has been split into 4 weeks, each with a different challenge and this week’s challenge was to share kindness with family and friends. I wanted to do a quick post to introduce you to the challenge, if you haven’t heard of it already and share my support of it as I will definitely be playing along with it. My week one creation features some notecards that I have made with a very cute stamp set by Honey Bee Stamps, which I’m very excited to be playing around with today. If you are into cardmaking and papercrafting then you might also be interested to know that Hero Arts have made the cutest stamp set to go along with this challenge, with a percentage of the profits going to charity too. It’s full of great sentiments and definitely one that’s on my wishlist. Unfortunately, the shipping cost to UK costs a lot more than the stamp set itself so I will have to wait a while until I have a bigger order that offsets the shipping costs – or until I visit the States. I definitely do need to get my hands on the stamp set as it’s just amazing! The sentiments are just so stinking cute that I need them in my life! But you don’t need them to take part in the challenge. In fact, you don’t need to buy anything in particular for the challenge – use what you have and do what you enjoy! To write a letter, for example, all you need is paper and a pen. If you’re a knitter, why not try knitting something and sending it to someone? The image above shows a bunch of notecards that I created this weekend in honour of Share Handmade Kindness. I used a stamp set by Honey Bee Stamps called Special Delivery for all of these cards – and for most, it was the only stamp set I used. The only exception to that is that I also used the letter stamp with a heart from the Mama Elephant set that I mentioned last week in my October Favourites for the background in two of these notecards, as well. I coloured these images in with some Winsor & Newton watercolours and die cut the stitched rectangles with a Simon Says Stamp die. I mixed my Aquafine watercolour paper with some Kraft coloured Neenah cardstock. I love how easy it was to make these notecards and how I only used a few supplies! All of them are also fairly easy to mass produce, if you wanted to send out a bunch of them to your family and friends. I had a lot of fun creating these cards and I can’t wait to send them out to my family and friends. There will be four challenges in the Share Handmade Kindness month as there is one every week. I would love to see what you create if you do decide to join in! To find out more about the Share Handmade Kindness, check out www.sharehandmadekindness.com! I’m in no way associated to the challenge, I just chose to support it as I absolutely love sharing handmade goodies out of kindness and wanted to encourage others to do the same.